There Actually Was A Method To This Madness! " Just Follow the "DOTS" Below! NOTE: (includes: "Armageddon Day" September 2008, "The Domino Effect", "Global Financials, & Government Backed Loans). All previously posted on AstralNewz & indicating these events. Solar Eclipse 01 Aug 2008: "To Lose Everything"
... its highest recorded close. Trading began to spike sharply as of Jan 8th of 2008. Trading leveled off again by March of 2008. Then: on July 25, 2008 the Heavy Trading began again. It remained so as of Feb 27th, 2009. By November 12th, 2007 the Dow was flirting with the upper 12,000's again. On Nov. 12th, 2007 the Dow closed at 12,987.55. Then; on July 07, 2008 ... Federal Regulators seized IndyMac. On Oct 6th, 2008 the Dow closed at 9,955.50.... from then on; it stayed below 10,000. It has been spiraling downward ever since. 2ND: If the 2007 Capricorn Ingress was accurate for 2008 .... will the 2008 Capricorn Ingress prove accurate for 2009? Huge Financial Growth is focused in the 7th House. So it could be in the Eastern Hemisphere, "Overseas" or "not in North America". This suggests Huge Monetary Investments .... but .... put toward: "International Concerns"
what about the Rat & the Ox? Also: Rat Years tend to see people being "Acquisitive" with that which doesn't necessarily belong to them. (Can you say Madoff ? Ox Years brings the need for Hard Work and the "Yoke" of Responsibility. Ox Years bring the need to settle "Domestic Affairs"
the need to "Put One's Household Affairs and House in Order" . The Ox Year also brings the Rise of Dictators. Those in Authority may not seem as "compassionate" as one would like. Finally; Ox Years are supposed to be good for "Harvests". So, this year might be a good year for a Vegetable Garden! All creating a "Domino Effect "
"500 trades away from Armageddon"
Armageddon was described as a 22% decline which would take the DOW to the 8,300 level. Guess What? In April of 2009 ... that's is exactly where the Market is: "Armageddon". Supposedly this was "headed off" by the Fed pumping in $105 Billion Thursday morning before the Market opened; thus preventing key institutional accounts from following through with enough sell orders to start a "cash run" that would have tanked the U.S. Economy. "The End of Civilzation's Current State of Affairs"
The Dow went below 8,000 on Nov. 19th, 2008. In these "2" New Moon Lunation Charts we get a Major "Head's Up"
... even if we hadn't been exactly "paying attention"
Click Image to Enlarge: Guess the PTB want Consumers optimistic in time for Black Friday Shopping? Jupiter/Hades = Admetos = "Deflation"
Energy credits for small wind properties, geothermal heat pump systems, & "energy-efficient residential properties"
New Renewable energy bonds: up to $800 Billion in bonds for public offering (From: 1/3 from "public power providers", 1/3 from various governments and 1/3 from "cooperative electric companies"
Tax Credits for "cellulosic biofuels" & "carbon dioxide sequestration"
Tax Credits for "New Qualified plug-in electric-drive motor vehicles.Bicycle commuters get some as do regulations aimed at: "residential top-loading clothes washers"
The TARP PROGRAM lets the Treasury Dept. buy mortgage backed bonds from financial institutions. A bank, though can still buy $100 Billion of bad Dept (sub prime mortgages), then, declare bankruptcy and sell it to the Treasury Dept at a profit. The Treasury Dept can also "guarantee" home mortgages as an underwriter more or less. The Treasury Dept can also cancel some of a home owner's mortgage debt (if it wants to) . Paulson gets to decide how much executive's get paid. Only the top 5 execs lose their golden parachutes. The rest still get them even if their salaries and bonuses are in the millions. Note: Medical Insurance is now to include Mental Illness with similar coverage. And, this is only the tip of the bail-out iceberg which is 455 pages long. President Bush's first proposed bill was only 3 pages. Ron Paul (Rep. TX) who in 2003 Predicted this bailout; said that this legislation would only harm the economy and that this last version is worse than the first one proposed. OUCH! O.K., the "Recession is Official"
The Year does not start out well. NOTE: This is a "Beginner's Chart". a Valued Person or Resource"
Now its President Obama's Turn at the U.S. "Bat". President Obama addressed his first Joint Session of Congress on 24 Feb 2009. 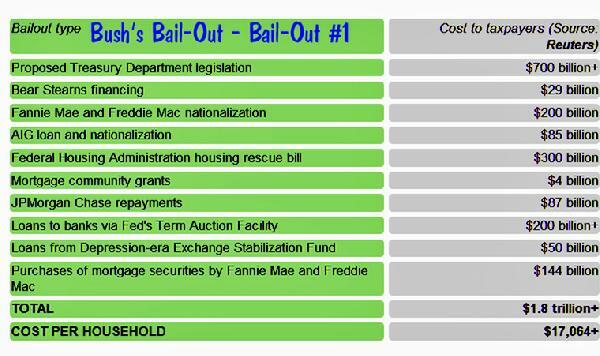 President Bush utilized the first "half" of the money available in the First Bail-Out Bill and then in response to President-Elect Obama's request; made the second half of that amount, available to President-Elect Obama. President Obama has addressed the American People in order to get support on his 1/2 of the First "Tarp" or Bail-Out Bill Money: Also referred to as the President's "Stimulus Bill"
The Dow closings have reflected Wall Street's Reaction to those offerings. 40 % of the Pork in this Budget belongs to Republicans. 60% to the Democrats. Click to Enlarge: Friday 13th, 2009 The Dow seems to be liking those 7000's! On Feb 27, 2008 the Dow closed at 12,694.28. "That sucking sound of all the jobs leaving America"? The Asian Markets went up, Citi & GM said no more money ... and... since they were now showing a profit, "See Yah"
Question: Is it Finally going to be Enough? This is the 2nd Friday the 13th in a row. On February's Friday the 13th, the Dow was up more than 600 points than it is on this one. Still, maybe St. Patrick's Day will bring a little Luck? The idea is that by inventing more money for the Banks, they will use it to offer lower interest rates instead of sending it off to France, Switzerland, etc. like they did the money they already got. This of course, adds to the National Debt and also lowers Treasury Yields. The Fed is buying another $300 Billion in Long Term Treasury Securities to do all this. So-called "trenches" made up of nothing but Imaginary Worth. QUESTION: Why don't they just give each citizen their own printing press, then we can just print the money out as we need it and actually pay some bills & expenses? The Dow is up almost 500 points today. and not enough of the smaller hybrids which people were NOT buying. Wall Street did not think this was such a good idea. BUT, now it has closed above 8000 for the first time since then. "Stay Tuned ..... we'll have to wait to find out"
It prints up the United States' money supply & makes money doing so. It can lend money to other banks as well. The monthly changes in the currency component of the U.S. money supply show currency being added into (% change greater than zero) and removed from circulation (% change less than zero). The most noticeable changes occur around the Christmas holiday shopping season as new currency is created so people can make withdrawals at banks, and then removed from circulation afterwards, when less cash is demanded. One way to prevent bank runs is to have a money supply that can expand when money is needed. The term "elastic currency" in the Federal Reserve Act does not just mean the ability to expand the money supply, but also to contract it. Some economic theories have been developed that support the idea of expanding or shrinking a money supply as economic conditions warrant. W h a t ' s a n "I n d y M a c"? Countrywide Mortgage Investments (founded by David Loeb & Angelo Mozilo in 1985) became IndyMac Mortgage Holdings, Inc. in 1975. IndyMac bought up SGV Bancorp in 2000 (SGV Bancorp was the parent company of First Federal Savings & Loan Association of San Gabriel Valley) and changed its name to IndyMac Bank; becoming the 9th largest bank headquartered in California. ... then... in 2007; IndyMac Bancorp bought the New York Mortgage Company and Barrington Capital Corporation. with "Mac" being the contraction for "Mortgage Corporation. IndyMac Bank's assets were seized by Federal Regulators. The Office of Thrift Supervision transferred IndyMac's operations to the FDIC as it did not believe IndyMac had the funds to continue. According to Regulators, the immediate cause of the closing was a letter from Senator Charles Schumer of New York declaring his worries about IndyMac being another "Countrywide". Customers had begun a run on the bank following the June 26th release of a letter by Senator Chuck Schumer (Dem. NY) urging several bank regulatory agencies to take steps to prevent IndyMac's collapse. As a result of Schumer's letter, in the 11 days following June 26th ... depositors took out more than $1.3 billion. In addition: on June 30th, Scott + Scott LLP filed a class action against IndyMac on behalf of people who had bought common stock between August 17, 2207 & May 11, 2008 ... maintaining that IndyMac issued materially false & misleading statements which inflated the price of their securities (thus harming investors). "This institution failed today due to a liquidity crisis ... although this institution was already in distress, I am troubled by any interference in the regulatory process." .